Moloch grimaces and keeps his wand out and ready to activate at a moment's notice. "The chances that these things are benevolent... are quite slim," he mutters. "At best, they are mimicking drow features for some nefarious deception. At worst..." he shudders. "I don't want to know how it'd feel to have those tumescent red fungi growing out of my skull." ooc: that picture... is that a "full body" image with creepy white spindly limbs, or are we just seeing a face with white hair (or some other material) hanging from it? OOC: There's no question what you're looking at were once drow. The wisps are both white hair and flowing mushroom appendages; however, they are walking on clearly two dark elven legs, not weird mushroom spindles. OOC- I think it's supposed to be a Bust portrait (like most of the art in this book), the white bits are hair. IC- "Perhaps they cannot hear. Moloch, would you be able to speak to their mind? I do not know if there will be any mind to speak to, but perhaps it would aid our understanding of their intent. If they are in fact passive, we would do best to pass them and continue on." The "drow" still continue their ways; they haven't even so much as shown a twitch of recognition while you two are conversing. Moloch shifts uncomfortably, then perks up. "I've got a better idea." He raises his wand, utters ድምፅ-አልባ ምስል [casts Silent Image] and a perfect double of Moloch appears in front of the group, then starts calmly walking towards the three creatures, its hands empty, palms forward, and arms held out in a non-aggressive gesture. OOC: Love it! Inspiration to Moloch if you didn't have it, if you do have it, you can give it to one of the other PCs. As before, the drow don't pay any attention to the image even when it gets within 15' of the drow. The drow nearest the image is focused intently on a small patch of mushrooms that look more like purple grass growing out of the cavern floor than mushrooms. Do you want to make the image do anything else or get closer? Moloch directs the image stride up right next to the "drow," and if they still don't react, it will step right into the purple mushrooms, appearing to jostle and crush a few stalks. The "drow" still don't react to striding right up to them. As your image appears to crush some mushrooms, the nearest drow calmly bends down toward the illusionary crushed mushrooms and tries to straighten them back up, but after physically interacting with the illusionary mushrooms, returns to the same task it was doing before. Moloch, you're pretty sure these are some sort of automaton or thrall; they're simply not doing anything other than tending the mushrooms. Also, as you've gotten close to the drow, their otherworldy appearance has been so startling to you, that all the PCs need to make a DC 10 CHA save please. Scafell check your PMs please. Scafell says "Embryo chord resist. Mechanical bar tone step? Bond beard prove terrace!" Castien's eyes go wide. "Is this what happened with the giant?" He asks Moloch? Regargless, he looks towards Scafell, who seems to be trying to speak, even if his vocabulary is a bit scrambled. "Scafell, can you understand us? Do not panic. Can you nod your head to at least signal that you are capable of basic reasoning and communication?" Scafell glares, nods his head very deliberately, and says "Mosquito threshold! Preoccupation sniff vat basket note! Pledge!" Moloch, you want to chime in? Also, what does everyone want to do about the thralls? Scafell, feel free to mime your intentions. Jijmar pipes up, "Sure thing. These guys are just mindless automatons..." As he says that, he rips a mushroom stalk out of the ground and throws it at the nearest "drow". The stalk bounces off of the "drow" and hits the ground. The drow mechanically picks up the mushroom stalk, straightens it, and then sticks it in the top of its head, like an 18th century gentlemen sticking a plume in his hat. Moloch, you ready to move on? OOC: Me too; schedule can be tough in the spring. The party moves on from the apparent mindless automaton drow mushroom cultivators and spends another solid day travelling through similar tunnels with the occasional larger mushroom patch. The party rests for the "night" without any incident and sets back out down the tunnels. After a few hours, Stool gets excited, telepathically telling the party, "Yes! Yes! We're almost there! I can feel it in my feet!" After about 30 minutes, the party comes through a narrow cleft in a passageway, and all of a sudden the stench of decay abounds; however, this is the stench of a wet forest floor, as opposed to the stench of a crypt. Pale cream and beige stalks grow thick and tall, resembling a surface world forest. Fungi grow in profusion everywhere, and it's hard to find anything resembling a path between them. 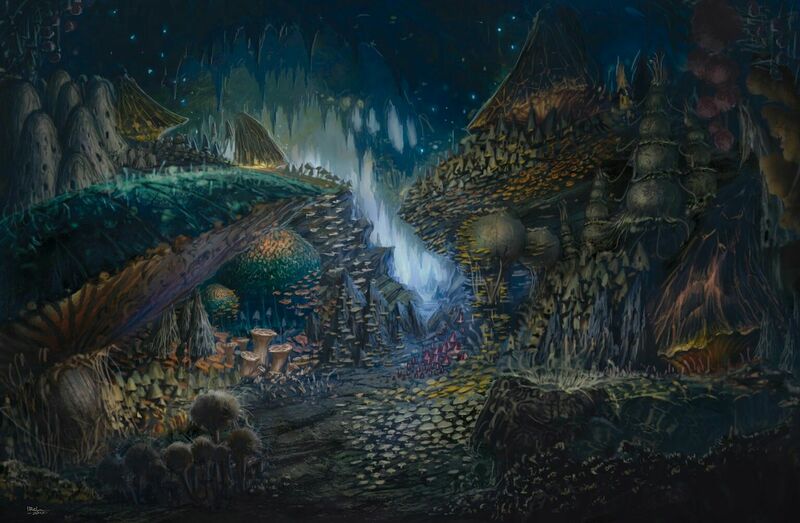 The giant caps of zurkhwood mushrooms obscure your view of the cavern's ceiling, but luminescent fungi there give off a shimmering aura. With each step taken on the soggy ground, a rank scent of decay rises around you. Stool says, with a tone of rapture, "I'm finally home!" Without even looking back he heads off into the mushrooms. From your current vantage point you don't see any other myconids or other creatures; just mushrooms and more mushrooms. "Stool! Do not wander off! We do not know if there may still be danger here!" He casts Light on his drow-made short sword, and hurries off after the myconid, though it only need be a brisk pace to do so. shortsinsnow wrote: "Stool! Do not wander off! We do not know if there may still be danger here!" He casts Light on his drow-made short sword, and hurries off after the myconid, though it only need be a brisk pace to do so. Castien sees a patch of shriekers at the edge of his dark vision but they are off the path from the direction Stool is traveling. Moloch, Scafell, what are you doing? Moloch cheerfully whistles a jaunty tune and follows after Stool and Castien. Scafell follows along, looking closely at mushrooms for evidence of anything odd. shambling mound that is depleting the soil in places. After about 5 minutes of following Stool into the mushroom forest, a tall and lean myconid, approximately 9 feet tall steps in front of Stool. A cloud of spores release from its cap as he bends over and reaches a fungi-esque hand down to Stool. Stool hops on and says via his spores, "I'm really home." To the myconid he says, "I am Stool of Neverlight Grove... you look like one of the Hunters... but I've been away more of my life than here... I'm sorry... I'm rambling..."
The rest of the party hears in their minds a deep presence, "Yes, little one, I am one of the hunters. Loobamub's my name if you wish to search your memory. It's wonderful to see you back; but, the grove is not the same as it once..." The myconid seems to trail off and stop speaking. "You have... compatriots? Helpers? With you?" Stool replies back, "Yes! These people are my friends. They rescued me from the drow and brought me here! They are our friends." Loobamub turns to regard Cas, "An elf? But not like one I've ever seen before... where are you from stranger?" OOC: Also, I owe JasonW an apology; I harassed him for posting and then got really mad at the game. I didn't realize he had posted over a week ago. My fault guys. Please forgive me. The myconid replies, "My spores tell me you mean me no harm so I'll take the little one's word for now. Drow I know... Menzoberranzan I've heard the name. Spiders we see all the time. But what is this surface? Are you from the roof of the caves?" Cas, you're getting the feeling that the literal concept of the surface is escaping him. "Fascinating...well, we are from another...cave system. One of different plant and animal types. One where the cave ceiling is very, very high, and, well...we live quite far above you. There are many people like myself, who can survive in that cave system as well as these, well enough at least. And there are some who cannot survive well in this one, one so dark and cold. Your people have done well in this cave, but I suspect would not do well in our caves. Too much light, I think." Cas says. He fumbles for words, as he is quite excited and also well out of his given field of expertise. "Too much light? Harrumph! We have plenty of light here already. I don't think I'm the best one to talk about your special cave system; perhaps talking to the sovereign will make more sense. Stool, you should introduce these visitors to the Sovereign when you get a chance. "Also, mind your step in the outskirts of the grove; there's a shambling mound running around and I'm trying to catch it. Don't let it catch you." OOC: Scafell, Moloch, you have anything you want to ask of the mushroom man? What does Moloch know about shambling mounds? Baelem wrote: What does Moloch know about shambling mounds? A shambling mound, sometimes called a shambler, trudges ponderously through bleak swamps, dismal marshes, and rain forests, consuming any organic matter in its path. This rotting heap of animated vegetation looms up half again as tall as a human, tapering into a faceless "head" at its top. It's a large plant monster that eats anything organic. FYI: I'll be travelling until the 15th but I'll try and keep things moving along. I'm back. Moloch you have a reply? Scafell? "Is there anything we should know about the Sovereign, friend?" Stool pipes up: "The sovereign is our leader and forms our voice when we join... or... maybe meld is the right word?" The adult myconid says, "Well... at least that part is right... however, we are divided at present... there are two sovereigns, and not everybody melds with everybody anymore... I don't like it one bit."